at the Leith School of Art / former Norwegian Seamen's Church. On 29 July 1943 a Halifax bomber was flying over German territory, near Hamburg, when it was struck by heavy flak. The pilot was a young Norwegian from Bergen, and what he felt and what thoughts raced through his head as his plane hurtled to the ground we shall never know. Miraculously, he survived the crash, and after five days on the run he was caught and spent the rest of the war in a «Stalag», a German prisoner-of-war camp. This exhibition tells some of his story, - a story that could have been told by so many. One of the most moving and powerful anti-war paintings in history is Picasso’s «Guernica» which was painted in response to the suffering caused by the Spanish Civil War. War as a phenomenon is a recurring theme in the history of art, and many artists have described the horrors of war in words and images. Art historian Christiana Spens, whose writings also deal with war-related trauma and art, points out that art can also have a rehabilitating and healing effect in situations where individuals and society have been exposed to war or political violence. In relation to the victims, and also society, this is done by sharing art with others, thereby creating an understanding of and empathy with those affected. The idea that art can alleviate the grief of an individual, or of a people, stems from the concept of «moral art» (Tolstoy). But art can only be moral if it is founded on an established perception of what morality is and an approach to the practice of art that is based on personal ethics. 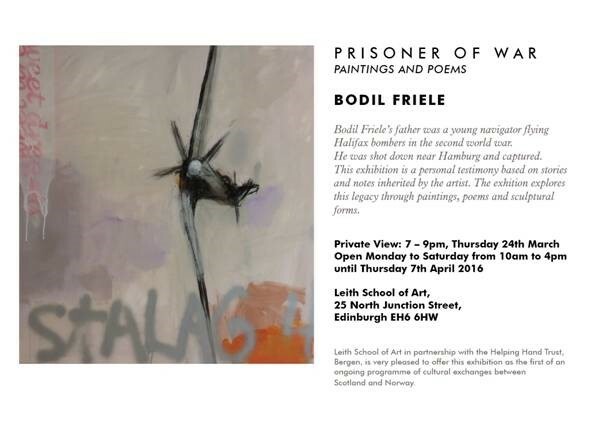 This exhibition with Bodil Friele takes a very specific story as its point of departure. She draws on her personal experience of growing up with a father who was troubled by sleepless nights, but who was not prepared to discuss the causes. In those days, post traumatic stress was an unknown phenomenon, but today we know that wartime experiences leave scars that must be treated. But with the passage of time, and from her father’s poems and notes from the war years, the picture has become clearer. She sees the cost of the war and takes a moral stance on it on behalf of the many who experienced its horrors. Through her pictures, where she combines texts with images, we are immediately confronted with our moral heritage, brought face to face with history as it was, and as it still is in many places in the world. Most of us have no understanding of what it means to be held captive. To be deprived of our freedom and forced to live our life according to the dictates of others. It is this experience that forms the basis of the exhibition entitled «Prisoner of War, paintings and poems». It is a personal testimony based on stories and notes that the artist has inherited. The exhibition takes this legacy and transforms it into textual, pictorial and sculptural forms.